A World Full Of Beautiful Confusion! A Wife & Mother's Plan to become One Big Happy Family! What Do We Specifically Believe? Science That Supports God's Existence! Art, Dance, Music and Poetry Inspiring A World For Good and For God! Blog: What Would It Take To Be One, Big, Happy "Human Family"? Blog: Cool Facts Proving "God Loves US All!" Blog: World Family Tree - Genealogy Tips & Inspirations! They are small, but full of love, joy and gratitude for each of the opportunities, as they come! Grace of what we learned about Haiti in the photo below, we collected hygiene kits and other supplies to send to the people there! we all felt honored to get to know them and proceeded (in the next few months following their presentation) to gather supplies to send to Haiti with the hope that we could help make a difference for those with needs in their country! If you know of any organizations that can take these supplies, please let us know at thegilbertacademy@yahoo.com. 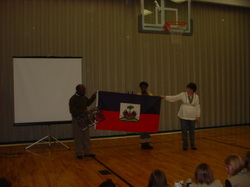 Please entitle your e-mail: "Transportation to Haiti". Thank you very much! 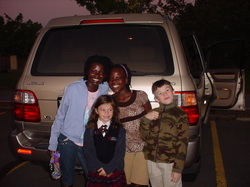 Thank you for supporting these precious orphans and other sweet African children! We just adore them! Each student needs two $30 a month sponsors to have their needs provided for. We hope to continue to see them on their next tour, We Love You Guys and Galls! Their director has the list, we will have to get it posted for you all! Our Campaign To Uphold Justice!